If your home’s comfort and efficiency are on your mind, look to Nunning for a geothermal comfort system that meets your heating and cooling needs today and far into the future. Ensure comfort & savings with the most energy efficient, cost effective, and reliable system available. No matter what climate you live in, the temperature throughout the year varies. For some climates that means blazing summers that cool to frigid winters. What many people don’t realize is that the temperature below ground (regardless of climate or season) stays fairly consistent all year. The ground is able to maintain a higher rate of temperature consistency because it absorbs 47% of the suns energy (heat) as it hits the Earth’s surface. 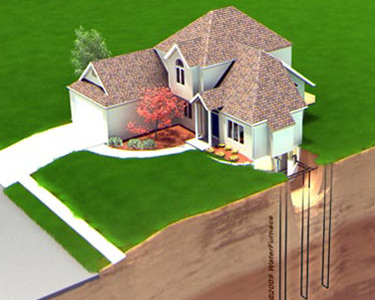 WaterFurnace geothermal systems are able to tap into this free energy with an earth loop. This technology is then used to provide your home or office with central heating and cooling.